Timothy DeCrane’s path to the priesthood has been marked by major moments of doubt, like the time a counselor told him that the results of his career test strongly indicated he should become a lawyer—and DeCrane imagined himself going to law school, joining a firm and having a wife, children and a dog. “And don’t forget the house with a white picket fence,” the 25-year-old seminarian says with a laugh. But God has kept putting defining, doubt-removing moments along the path, he says, including the time he rode along with Father Wilfred “Sonny” Day as the pastor of St. John the Baptist Parish in Starlight drove to the scene of a fatal farming accident in southern Indiana. “It’s one thing to hear how priests see life and death in a single day. It’s totally different to witness it for yourself,” says DeCrane, who had just finished his first year at Saint Meinrad Seminary and School of Theology at the time. “I was with Father Sonny when he got the call. Driving over there, I’m freaking out. But when we got out of the car, this great sense of peace came over me. The family wanted Father Sonny there. He went into the ambulance where the body was, and said some prayers over the person. There were some family members in the field, and he was present to them. Then he went to the farmhouse and met with the mother and the siblings. 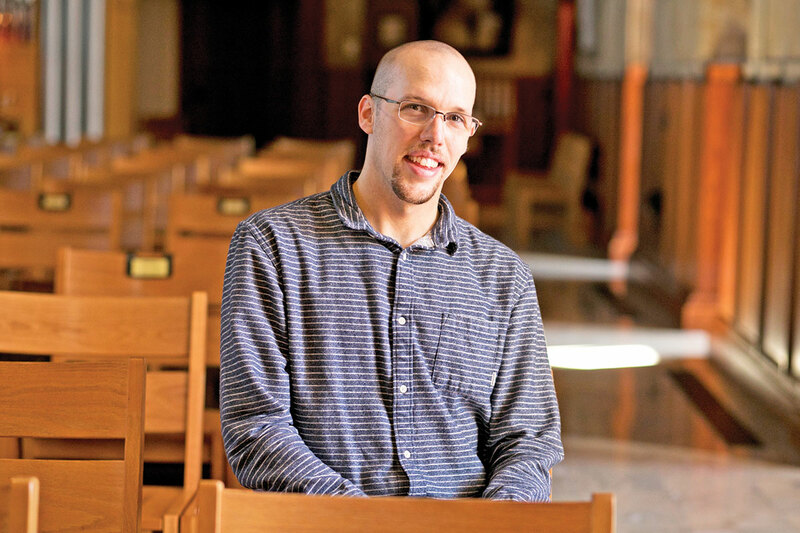 Still, the doubts kept surfacing in his second year of seminary at Saint Meinrad as some friends left the seminary, and some friends back home in the Indianapolis area shared the news of getting engaged, getting married, having kids and buying new cars. Then came the news that he was assigned to spend the summer following his second year at Saint Meinrad as a student chaplain at St. Vincent Indianapolis hospital—in the emergency room and the intensive care unit—one of the last places the self-described “germophobe and hypochondriac” wanted to be. “It shows that God has an ironic sense of humor,” he says with a laugh. God was there to walk with him again, he says. Working with some non-Catholics, DeCrane found the confidence to share his story and his faith “in a way I hadn’t before.” He also found the strength to put aside his fears and focus on the patients he met face to face. “Being in the ICU and the emergency room, you see victims of gun violence, child abuse, domestic abuse, drug overdoses and auto accidents. It reminded me of the summer before, working in those moments when you see life and death. But it also makes you see the depth of spirituality and the depth of the impact you can have on people. His confidence and his belief in God’s direction for his life grew even more during his pastoral internship experience at St. Bartholomew Parish in Columbus from September of 2016 through May of 2017. During those nine months, DeCrane led a confirmation class, headed prayer services at nursing homes, was an extraordinary minister of holy Communion at hospitals, served as a substitute teacher in the parish school, and guided candidates in the Rite of Christian Initiation of Adults program who wanted to be received into the full communion of the Church. His embracing of his calling was also noticed by others. During his time at St. Bartholomew, he shared an office with Kathy Davis-Shanks, the pastoral associate at the parish. As the vocations director for the archdiocese, Father Eric Augenstein was impressed when he visited DeCrane at St. Bartholomew and watched him “from a distance as he interacted with parishioners and staff in an easy-going, friendly and sincere way. “I thought to myself, ‘This is what priestly formation can do.’ It takes a young man who hears a call from God, helps him grow in personal discipleship and in ministerial skills, and works to mold him in the image of Jesus Christ. Another quality that will serve him well as a priest is his sense of empathy, says Father Robert Robeson, the pastor of Holy Name of Jesus Parish who has known DeCrane since Tim was about 10. 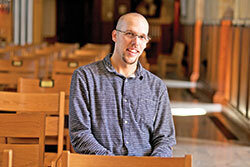 Father Robeson knows the struggles that DeCrane has faced in his path to the priesthood. For DeCrane, the doubts have faded. They’ve been replaced with a sense of joy and purpose in anticipating that he will be ordained as a transitional deacon in 2018 and ordained as a priest of the archdiocese in 2019. “I’ve really seen the hand of God in all the experiences I’ve had—when I thought I couldn’t do it. I’ve learned, by and large, that the joy priests have is authentic. So is the brotherhood among the priests. And there’s the influence of Pope Francis to live the joy of the Gospel.